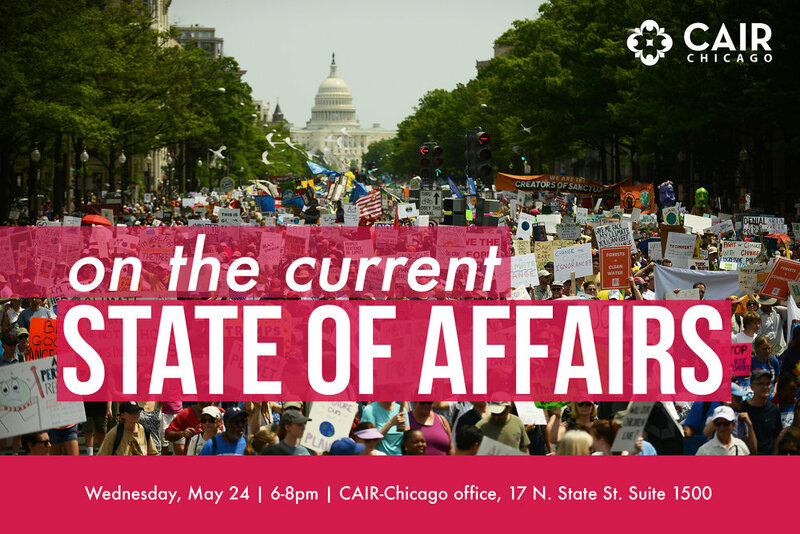 CAIR-Chicago is hosting a panel to discuss contemporary sociopolitical issues related to anti-Muslim racism and the current state of affairs. We’ll explore what the remaining days leading up to the 2018 midterms and the Illinois governor's race for communities that have been threatened by questionable, apathetic and dangerous policies. Our discussions will lead to us determining meaningful, sustainable actions to uphold, equity, peace, prosperity and inclusiveness for all communities. Please confirm your RSVP by completing this form before noon (12:00 pm) Tuesday, May 23rd. Seating is limited, so only one guest can be included. If you have any questions, or need to cancel your RSVP, contact Gerald Hankerson, Outreach Coordinator, at ghankerson@cair.com. You can also call the office at (312) 212-1520.